DIEHL is a family-owned company which employs over 16,000 people world-wide and creates technologies of the future. 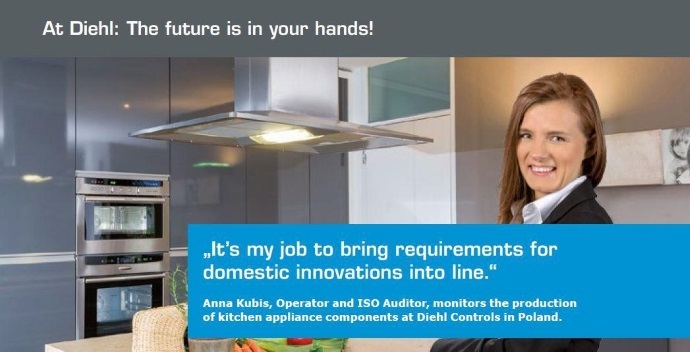 Diehl Controls is one of the leading manufacturers of control systems with over a fifty years’ experience in designing and manufacturing of electronic and electromagnetic products for a number of renown manufacturers of household appliances. Optimizing and constant improvement of process related with hardware development. Experience at a similar position in international team. If you are interested in the above job position and you wish to share your ideas and skills in a multinational company, please send your CV in Polish and English through the "Job Portal" located in the "Career" tab on our website: www.diehl.com/pl/kariera/job-portal.html. We inform that we will contact only selected candidates! I hereby give consent for my personal data included in my application to be processed for the purposes of recruitment pursuant to the Personal Data Protection Act of 29.08.1997, consolidated text: Journal of Law of 2002, No. 101, item 926 as amended.